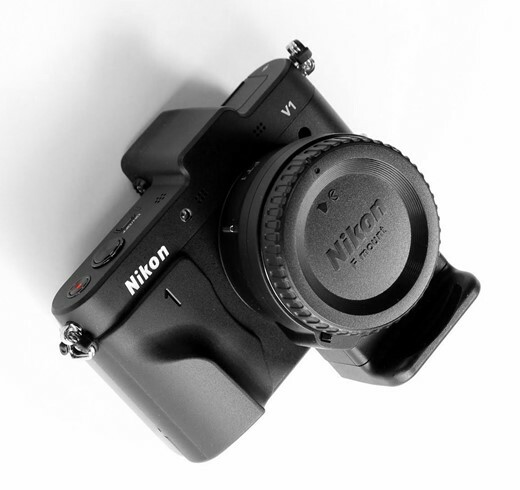 Richard Franiec has announced a custom grip for the Nikon 1 V1, adding to the one already available for the J1. The V1 grip slots over the ridge on the camera's front plate, to offer a more substantial surface to hold on to. Unlike Franiec's previous grips, the V1 grip extends across the camera's front and has the camera series '1' etched into it. The grip will be available in the second-half of March 2012 at a cost of $34.95, plus shipping. This grip is designed specifically for comfort and safety when handling heft of Nikon V1, especially when coupled with FT-1 adapter and heavy lenses. The grip does not obstruct battery/card door and preserves original location of tripod socket on centerline of the lens. Once applied the grip becomes an integral part of V1. The grip is individually machined from high grade aluminum alloy, glass bead blasted then anodized for durability. It attaches to the V1 with clear transfer VHB tape known for ultimate bonding power. Custom V1 Grip (CG-V1) will be available in second part of March 2012 for $34.95 plus shipping. Gosh! What a lot of stupid postings this product has attracted. A businessperson named John lives in the same region as a world famous website's office that receives over 20 million visits a month. John has a good high profit product but doesn't have the budget to buy advertizing on this site. In a wise business move he offers one of the employes a commission for units/sold/month if he posts press releases of his product. With his high profit margin product he could offer say... $5 a unit commission and still double his money. 1000 units/month = $5000. Easy money. The employee accepts this profitable arrangement. With 20 million visits a month the huge increase in traffic and sales to John's website both parties prosper. However to the many companies who's press releases are continually refused by this website, the ongoing coverage of Johns product becomes suspect. Pretty strong accusation there... any proof? No proof and unlikely this is happening. However DPR is owned by the biggest retailer in the world. With such a high volume of visitors, any comment by DPR is worth thousands of dollars. The smallest ad campaign on DPR is $10K . Franiec is one or two man operation. His products are good, however they are all variations on the same design and he lives in the same region as DPR. Imagine if BBC World News reported on every new doughnut flavor invented by the coffee shop down the street. One BBC news report understandable, but after that it starts to get suspect. The RF grips are news for blogs and forums, not the worlds biggest camera site. What about the Jobys, Hoodmans, Lensmates etc (go to a trade show and see thousands of clever products)? Every season they have new products. The above scenario is not far fetched and been done thousands of times before. So as the devils advocate, nepotism , kickback, graft etc. come to mind. I have used one of Franiec's grips for my S95 for quite a while. It's excellent. Most people don't know it's not part of the original camera. It makes carrying my $400 camera more secure and comfortable. I don't regard it as a waste of money at all. Sometimes you can't judge the ergonomics of a camera until you've used it for a while, especially since everyone has a different opinion about what is comfortable /for them/. I am a little surprised at all of the mostly-negative comments from people who've never used one of his grips or this camera. I totally agree. Have the same grip for my S95, and had one before for my G9. The camera feels more secure when using with one hand, and it's right: does feel and look as if part of the camera! I would surely buy a Franiec's grip for a Sony RX100 or any other camera that was too much designed by marketing-men. I guess we still have plenty of fools in this racket with money to waste. Why would I spend a small fortune on a Nikon 1-series toycam -- just so I can shell out extra dough immediately for a 3rd party grip that should have been an integral part of the camera that Nikon brought out? Looks like one would be getting it by both ends of the stick going this route. @FrancisCarver you have literally been on ever Nikon 1 post ripping this system apart. Shut the hell up. Honestly, you've posted the same exact thing at least 10 times on this page. No one cares if you saw the Nikon 1 at staples, and no one thinks you're witty. Quit being annoying and ruining the fun for everyone. Ohhhhh.....thats pretty! I have one of his grips on my xz-1 and its very nice! well worth the money! Yes got one as well on my XZ1. I paid my V1 grip a sweet 73 euros : more than this one, but at least I can remove it, it is not bonded by some magical adhesive. We would also like to see some pictures of this grip, not only from the same front end, 'cause the trouble with the V1 is it lacks some sort of "Thumbs up" device to take the thumb out of the mode wheel, and it looks as if this grip is not doing the job. Sir, if I may as to so inquire.... why didn't you just buy a camera that HAS a grip instead, hmmm? What's next? You will have to buy the battery compartment and memory card slot for extra money, too? Isn't dumb for Nikon not to have a grip on the V1 in the first place. Would really like to hear their reason for omitting it ? DUH ! Oh I understand now ... so that Nikon can sell their own grip to you at US$119 ! ! ! Highway robbery if you ask me ! Why does everyone quote manufacturers suggested price when they want to make a point. The GR1000 grip for the V1 sells for $89 USD. Fools and their money..... they will definitely be parted at one point. With the Nikon 1-series, is is obviously sooner rather than later. I just saw the Nikon J1 available for sale in my local stationery store. I sort of expecting to see the 1-series pop up in my local supermarket next. If you buy $500 worth of grocery, you can buy the "must have accessory" hand grip for 40% off, or something like that. I wish Richard would make something like this for the Leica M8/9. I have. He won't make one unless there is a lot of interest. I hardly think it would be a bust. It would be nice to have an alternative, something less expensive and bulky then the Leitz grip. So the camera was to small after all! Better make it just a little bigger next time like Pentax did with K-01. Tell you what: 300 bucks for the camera AND the grip sounds a heckuva lot more reasonable. That's a really nice idea but I'd probably get nice leather half case if I had a V1. This V1 system isreally growing on me and I may look at getting the next generation V1 when it comes out. I think with some REALLY fast prime lenses ( F0.95 or 1.0). I would be willing to try it out. Also a 24-120 standard lens(f3.5-4.5). Really growing on you? mate, that's not the V1, that's a wen. Glues on, like a real grip, and accomodates f-mount. more reason to save up cash for the V1. Nice looking grip. I know some people on the Nikon 1 forum will be happy to see this. Proof if proof were needed that the Nikon V1 was a bit of a rush job. I personally think the whole system needs to be looked at again in light of what's already out there and what's going to come on line. There are some clever things on the V1 the small sensor not being one of them. Fuji are going to steal the limelight from Nikon, if they haven't already done so, if I was in the market for a camera of this size with all that entails, I would give the Nikon a wide berth. This is just a personal view so for anyone who's already invested in the system I wish them well. Anyone invested in the system? Do you mean anyone who might actually have used the camera and might possibly know what they are talking about? I think "clever" might be a bit of a weak description of the Nikon 1 AF system. Perhaps "groundbreaking" would fit better since it completely overshadows AF systems from all other makers, including any one of them that you did not give a "wide berth". Say what you will about the sensor, the camera can get sharp action photos when no other small camera can. If you are looking for a slow boutique camera, look elsewhere. If you want speed and accuracy the Nikon 1 is the only small camera available. A rush job because of the grip? That's your "proof"? Anyway, your wacky theory aside, this N1 camera was in development for years and includes technology like phase detect AF on the sensor that none, that's zero of the other competitors were able to implement. Small sensor? It's been proven right here on DPR and in other comparisons that the Nikon 1 is as good or better in low light/high ISO than much of the m43 competition. 1-series by Nikon is well represented at my local Staples stationery store. Not exactly a high-end camera source venue, right? They must have figured, deep pocketed soccer moms will certainly have $1,700 to spend for the camera, 10x zoom, and grip. That funny because that's the thing I like about it. It reminds me of the understated Leica look, simple with very clean lines. Regarding the Nikon lenses presently available for the 1-series.... they certainly were intended as a joke, correct? Panasonic G3 needs a grip! It does, but the integrated grip contour and material probably makes it very difficult to design one. Another slow news day on DPReview? This is new. franiec makes top notch product. "The adhesive used for mounting the grip is VHB (very high bond) 3M clear transfer film for unparallel bonding power in all possible environmental conditions. Despite the holding power, the grip can be carefully removed without damaging the camera finish or leaving a stubborn residue. After removing it, you can cover the adhesive with the original slick backing material for storage so that you can reattach the grip later." I doubt very much that it would affect your Nikon warranty. Every time a manufacturer comes out with yet another ergonomically silly retro design, Richard Freniac laughs all the way to the bank. His grips are superb, and make a huge difference to a bar of soap. I like the original V1 grip and the clean design of the camera, so this is not for me. Besides, this grip probably invalidates the warranty since it modified the camera. I would at least ask Nikon before gluing it on permanently; otherwise it can become a very expensive grip. I was always wondering.... when will the often talked about, yet under-represented DENTAL FLOSS finally make its grand entry to the world of digital photography. And voila! I used one of his grips on my Canon S90 and it was a great improvement! It seemed very much like something that the camera should have shipped with. Bravo Richard on what appears to be another excellent product! Nikon V/J in white with custom grip gets more appealing, imo. How does this grip, or any after market grip fare for adhesion? When ever I've used self adhesive mounting tape, even professional grade in other applications, it goes well until the temperature rises and then the glue softens and breaks down quickly. I have a Franiec grip on my Canon S90. It looks and works great, and there hasn't been any hint of loosening. A big improvement for securely holding the camera, particularly one-handed. I'm not yet convinced by the camera, but I like the grip! and is not from the government. possibilities of financial gain by profit-making companies? I think the grip would be useful for certain users. I didn't mean to sound too harsh.. but if you've ever attended one of the major photo expo shows, you'll note hundreds of booths of companies (many of them fairly obscure and unknown) marketing various doodads and gizmos for photography. My LCD wipes comment was a bit tongue in cheek but came from remembering the Hoodman booth at a show (lots of custom thingies for viewfinders and lcd screens specific to camera models). I really was just curious if whether if any/all companies who can manage to write a press release and email it to DPR, will get it published? It would depend - if we thought our readers would find them interesting. We found out about Richard Franiec's grips from our forum, where people said they liked them. This one also addresses a concern we expressed in our review (the lack of proper grip on the V1). That's why we published it. i found the Toma half case on my Nex to be one of the best accessories i've purchased. really helps with grip, probably not as much as this though.